A blog post by Museum member and volunteer Marsha Nathanson. I recently read Glimpses of Jewish Baltimore, a collection of stories written by master storyteller Gilbert Sandler and co-published by the JMM. One story in particular resonated with me. In “Before the War: The Class of 1941,” Sandler recalls the night in March 1940 when bandleader Eddy Duchin appeared at Forest Park High School’s Jolly Junior Jubilee. Reading Sandler’s heart-warming story, I had a sense of deja vu. My father, Harold Nathanson, was a graduate of Forest Park High School, class of June 1940. 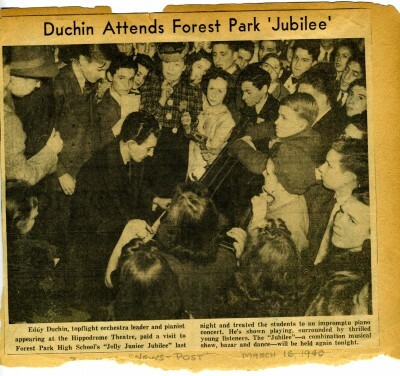 He was on the Jolly Junior Jubilee committee and witnessed Duchin’s concert. A photographer from the News-Post captured Duchin playing piano, surrounded by a sea of students. The photo appeared in the newspaper the following day. My father clipped the photo and pasted it in his boyhood scrapbook. Over the next several decades, the scrapbook traveled a circuitous journey, as my dad moved from adolescent to young soldier to husband and father. On the day that I read Gilbert Sandler’s story, the 72-year-old photo of Duchin was sitting on my bookshelf. “Never throw anything away!” my father always lectured. The article in question now resides here at the Museum. Thanks Marsha!